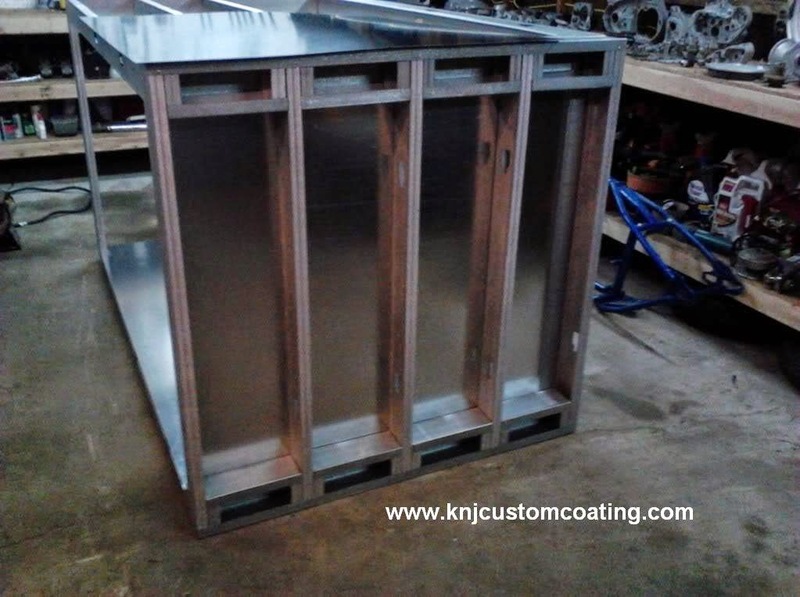 You can build your powder coating oven to the size you need, and you can also build in some features to make your powder coating more efficient. This article is a guide to give you an idea of what all is involved and the basic oven construction principles. A unique thing about this oven is that absolutely nothing protrudes into the oven space. The entire interior space of the oven is usable. 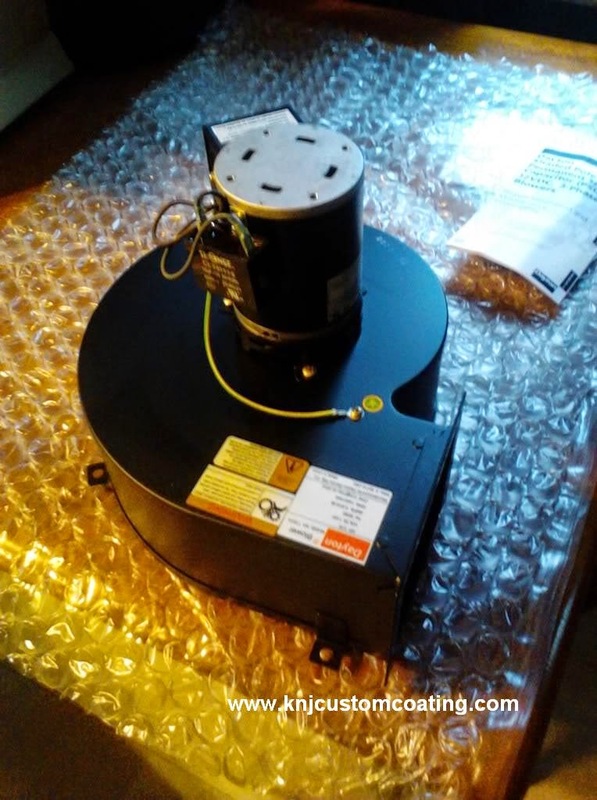 All heating elements, lights, fans, etc. are recessed into the walls. Building the oven this way allows you to build a powder coating rack that tightly fits into the oven with no wasted space. 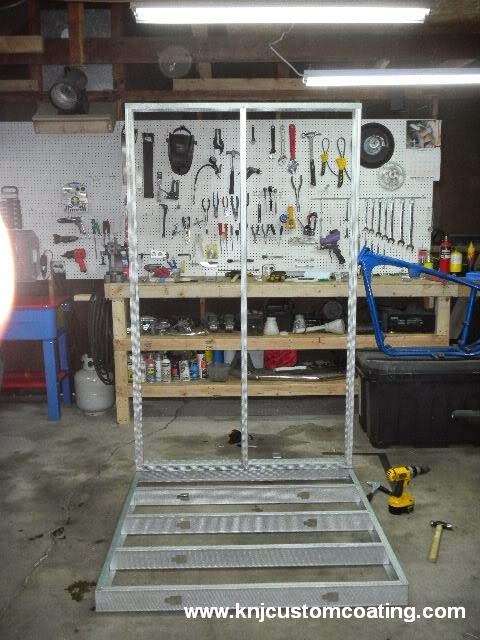 You would do all of your powder coating on the rack, then roll the rack into the oven for curing. This however, does add some complexity and cost of materials to the oven build. You can choose to build your oven like this for maximum space savings or you can go the traditional route. The great thing about building your own oven is that it is completely up to you. This particular oven cost around $1,400 to build. Some money can be saved by not recessing everything as that requires more material. But plan to spend at least $1,000 for an oven build of this size. 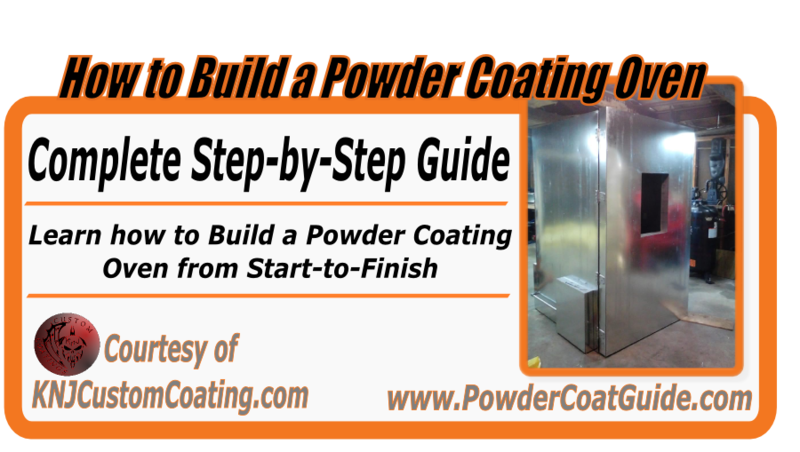 Quick Rundown of Powder Coating Oven Construction and Materials. The basic construction of this and most powder coating ovens is a steel stud and steel track frame which is riveted together. 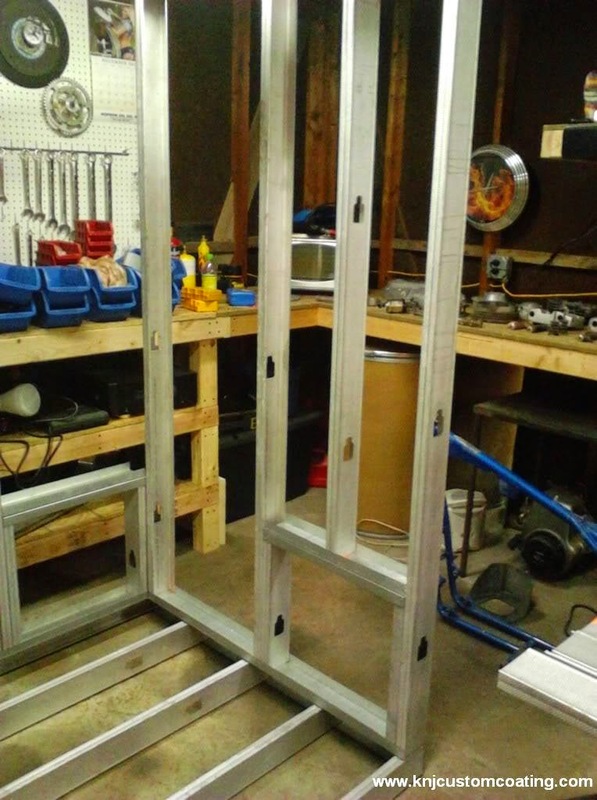 Both sides of the frame will be skinned with sheet metal with insulation in between. This oven uses 20-gauge sheet metal everywhere except for the floor which is 16-gauge sheet metal. 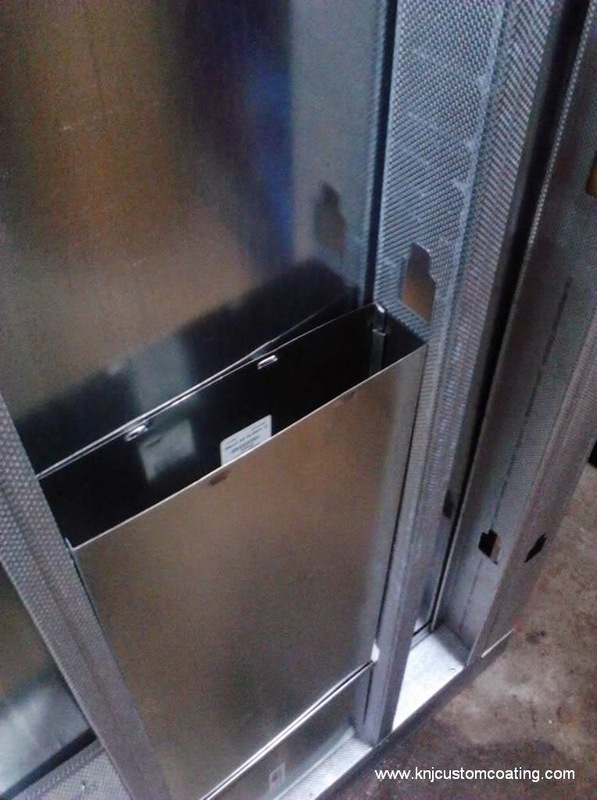 The reason for the thicker gauge metal on the floor is to allow it to support the weight of a powder coating rack. 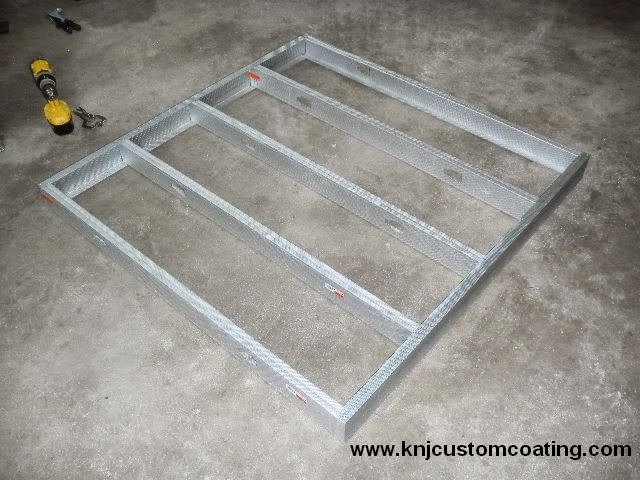 All sheet metal, studs, and track can be purchased locally from Home Depot, Lowe's, or a local metal supply company. You can buy it online as well, but shipping costs will likely cancel out any cost savings. 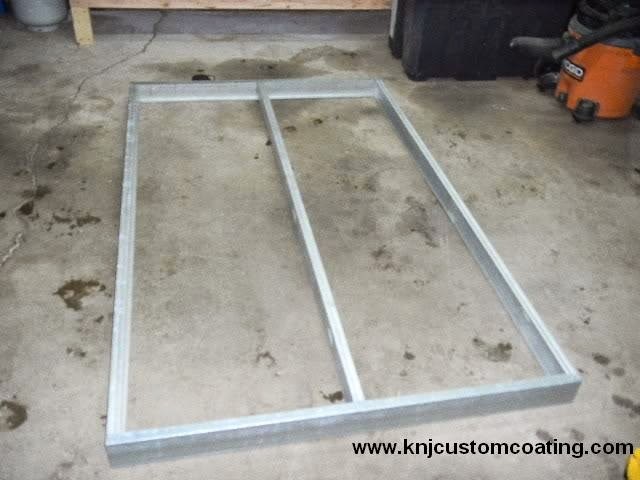 It is best to shop around, call some metal supply places in your area and get some quotes. Inside of the oven is where you will put the heating elements, which will be wired to a control box on the outside of the oven. We will start with the framing. The framing for this oven will all be made with galvanized steel studs and track. Steel track is very similar to steel studs except that they do not have a lip on the inside of the stud. This allows the steel studs to fit into the track. These are the same studs used to frame homes. They are available at both Home Depot and Lowe's for about $7.00 each. They are 3 5/8" wide x 1 5/8" thick and are available in 10' lengths or 8' lengths. It is best to buy a bunch of these to begin with. You don't have to get to scientific with it figuring out exactly how many you will need, you can purchase more as you go along. Working with these is pretty easy as they are quite thin (25-gauge). They are easy to drill and they can be cut with tin snips or a chop saw. Since you will be cutting a lot of studs, I recommend a at least a good set of snips like these: Wiss Tin Snips. The framing will all be held together with rivets Rivets are really easy to use, and they are cheap. You first drill a hole, then with a rivet gun, you place a rivet into the hole, squeeze the trigger and you are done. You are probably familiar with a hand rivet gun, but I strongly recommend a pneumatic rivet gun if you have an air compressor (you have read my article about How to Buy an Air Compressor right?). A pneumatic rivet gun will save you tons of time and you you'll still have use of your hands at the end of the day. 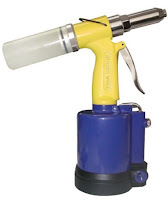 Again, I recommend a decent pneumatic rivet gun, this Astro Pneumatic Air Riveter offers a good price/performance ratio. It is by no means an industrial tool, but you will pay several hundred dollars for a high end pneumatic rivet gun. You will need lots of rivets to go with whatever rivet gun you decide to use. The most important thing about rivets is to make sure they are the same type of metal as what you are working with to avoid galvanic corrosion. Since this is a steel oven build, you will need steel rivets. Also important with rivets is to drill the appropriately sized hole. A pack of 1000 3/16" diameter x 1/8" grip steel pop rivets should get you through the oven build with a few left over. These will allow you to rivet stacks of metal with a maximum thickness of 0.125" and a minimum thickness of 0.020". Make sure to adjust accordingly if you are using thinner or heavier gauge steel studs and sheet metal. The 3/16" rivets mentioned require a #11 Drill bit for best fit. Now that you have your rivets, rivet gun, and studs, you can start to build the floor frame. Make sure you cut and measure the floor to exactly the size you want your oven to be. Your walls will sit on top of the floor. When making the square section of the floor, you will overlap the studs so that they sit inside of each other on the corners. Once you have the studs in place, you can keep them there with a locking c-clamp. You will then rivet where they overlap on top and bottom (see the red dots in the pictures below for rivet locations). Start with 1 rivet per corner so that the studs are able to pivot. Use a speed square to square up all of your corners before riveting into place. After you have all four sides secured like you see below, you can then go back and add more rivets to each corner. Once you have the 4 sides of the floor done, you will add more studs for support using the same procedure as above. The same procedure is used for the walls, the picture below is the back wall. The side walls are made the same way, just make sure you measure and account for the size of the back wall. 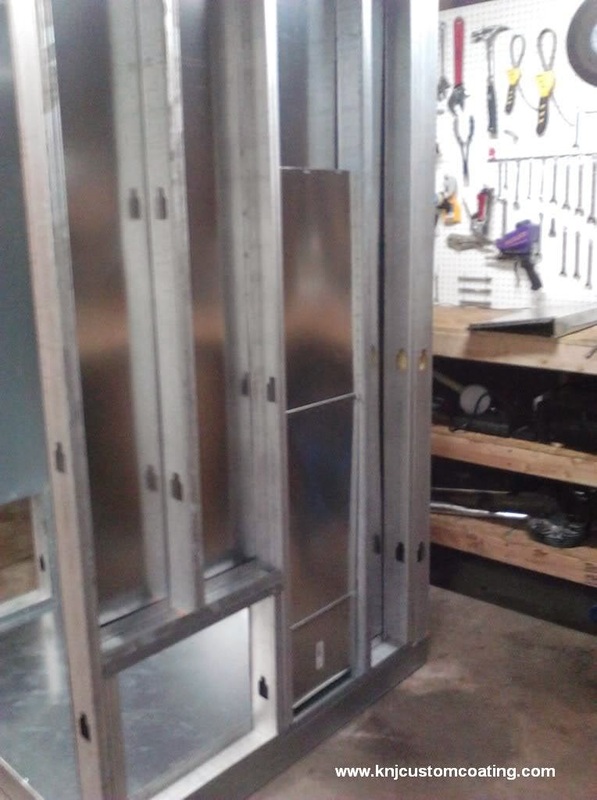 Once you have the back wall in place, and have constructed the side walls, you will put them in place and rivet them to the floor and to the back wall. This is the point of the build where the recessed heating elements come into play. 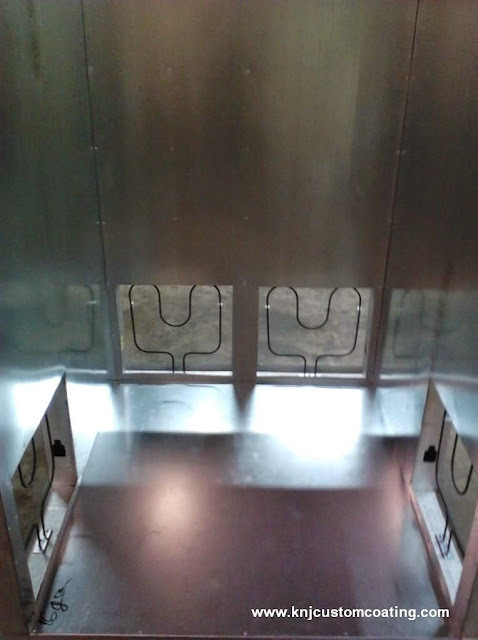 The heating elements have their own boxed-in sections in the walls, but every square inch of the powder coating oven must be insulated. The hollow place between the studs is where the insulation would normally be placed, however since the heating elements will be taking up that hollow space in these boxed in sections, another boxed in section of insulation must be added to the outside of the oven where the heating elements are recessed. If you do not plan on recessing heating elements and other items in the oven walls, then you will exclude these boxed in sections. Once the structure is framed up, you then will begin skinning it will sheet metal. 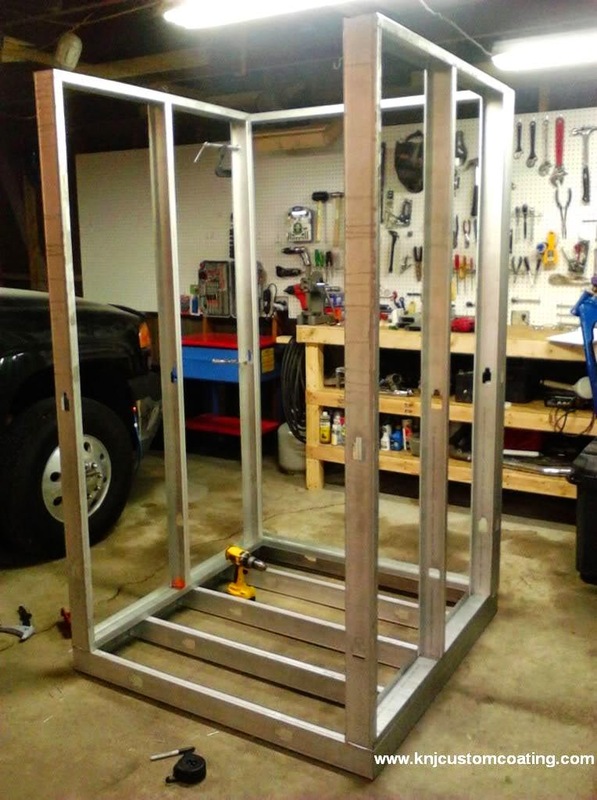 Sheet metal can be purchased at your local Home Depot or Lowe's but if you go through a metal supply company, most of them have will cut the sheet metal to your specifications. You will need long straight cuts here and metal companies have large brakes that can cleanly makes these cuts for you. I recommend galvanized steel sheet metal which will help keep your oven rust free. This particular oven uses 20-gauge steel everywhere except the floor which is 16-gauge. When choosing the thickness, you will want to stay in the 16-gauge to 26-gauge range. Each has its benefits and drawbacks. Using a thinner gauge is cheaper and will allow the oven to heat up faster. Thicker gauge is more expensive, but sturdier and will retain the heat better once the oven it is heated up. This saves on heating costs. 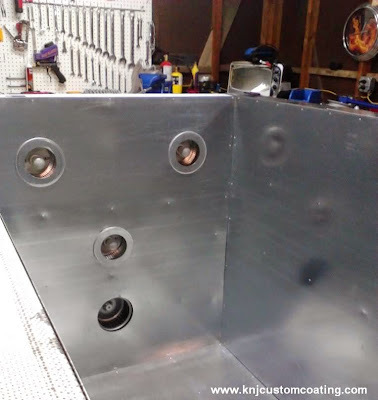 The first layer of 16-gauge is laid down on the inside of the floor and riveted into place, also additional stud supports are added to the bottom. Do not skimp on the rivets here, the sheet metal ties all of the framing together. After everything is skinned, the four cutouts for the heating elements are made using a Dremel. A pneumatic cut-off tool would also work here. Make sure to mark all your cuts accurately with a straight-edge and a square. This oven will have a convection fan on the top that will circulate the air from the top of the oven to the bottom. This helps equalize temperatures throughout the entire oven. Here you can see the duct work inside the wall of the oven that brings air from the top to the bottom. These slim rectangular types of ducts are called stack ducts. This oven uses 10" wide x 3.25" deep stack ducts. Here you can see how the ducting was wrapped around from the side wall to the top of the oven to the fan, and you can see the stack duct elbow partially visible on the top. 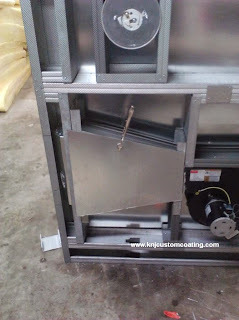 The same metal studs used to build the oven frame were used to finish the ducting to the blower. High Temp Sealant was used on the duct work to prevent the forced air from leaking into the oven frame. This sealant is rated for 600 °F. The top sheet metal duct piece was then riveted into place. That completes the convection system of the oven. As you can see, the air is pulled up through the top of the oven and is ducted back down the side wall and into the bottom of the oven using rectangular steel stack ducts, which will equalize the temperature throughout the oven. This is very important when powder coating as a large oven like this with no circulating air can have temperature fluctuations of up to 50 °F from the top to the bottom. This oven build has three recessed lights in the ceiling. 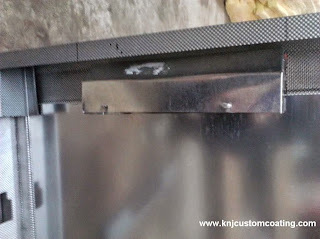 By recessing them, they will never interfere with the powder coated items inside of the oven. Recessing them does take some extra steps and a some extra parts as you can see below. If you choose not to recess them, all you would need is the light fixture and the bulbs. 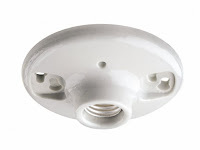 To make the light assembly, install the porcelain lamp-holder onto the inside of the 6-inch duct cap. Drill holes for the lamp-holder mounting hardware, and using a hole-saw, drill a center hole to have access to the wiring terminals. You then place the end cap with lamp holder onto the splined duct flex connector. 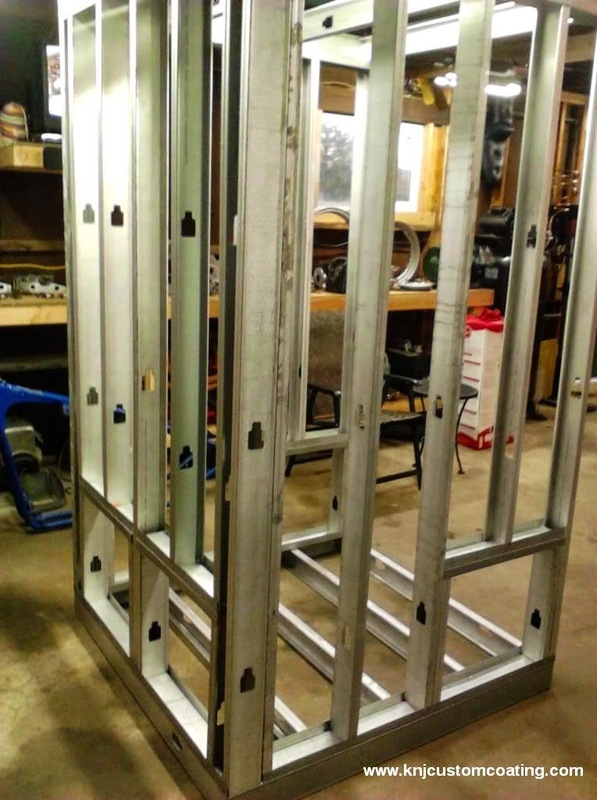 Then frame the assembly you have made with the same steel studs that have been used throughout the oven build. The bulbs and lamp-holder are completely capable of withstanding the 450 °F temps that the oven will be operating at. Here is a picture of the backside of the completed assembly. Here are the three light assemblies riveted into place. Before placing them, you will need to cutout holes for the duct caps in the ceiling. 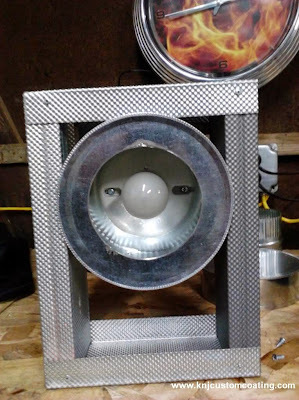 You can see the duct caps with holes cut in them placed through the sheet metal onto the light assemblies. This gives a nice finished look. The ceiling is completed now with the three recessed lights and blower fan. Every wall of the oven needs to be insulated. The insulation is responsible for containing the heat inside of the oven. 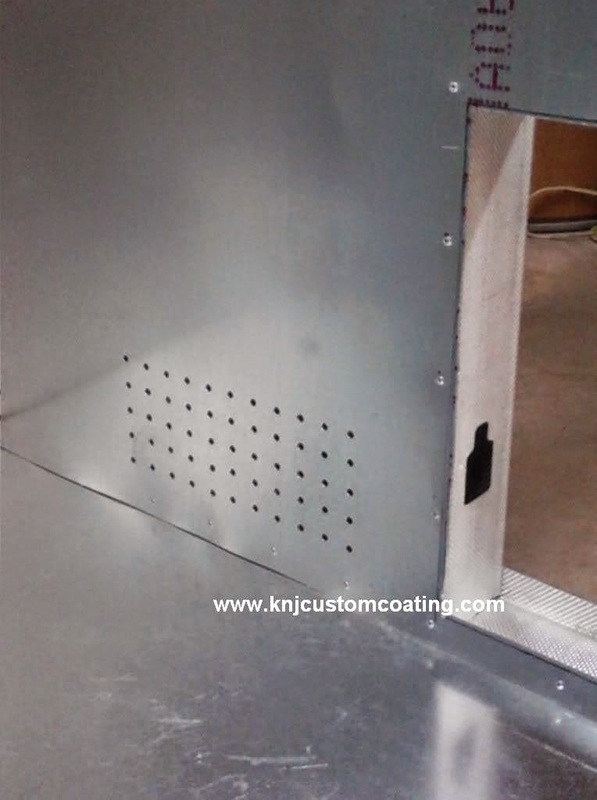 The most common choices of insulation for a powder coating oven are mineral wool or fiberglass. Mineral wool insulation has a higher temperature rating, however it comes at a higher price. If you plan on curing ceramic coating in your oven, mineral wool would be a better choice because of the higher temperatures that ceramic coatings require. 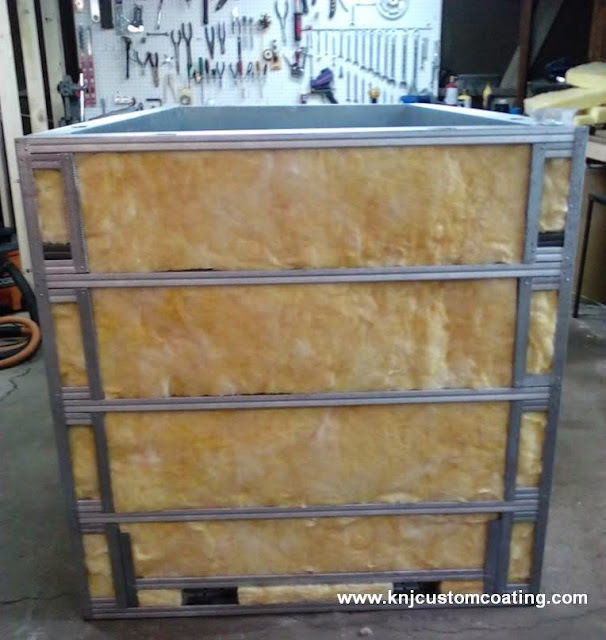 If you only plan to cure powder coat, you can use fiberglass insulation and save some money. This oven build uses unfaced R13 fiberglass insulation throughout. Two batts of insulation were used with some left over. Insulation like this is available online or at your local hardware store. You will need to put insulation in between every stud. Cut the insulation to fit in any odd-sized spaces. The easiest way to cut insulation is with a sharp utility knife using a 2x4 as a straight edge. When working with insulation, you will want to be wearing full safety gear including gloves, safety goggles, dust mask, long-sleeve shirt, pants, and close-toed shoes. It is very itchy stuff and even if you are wearing all of that, you will undoubtedly still be itchy afterwards. As you can see in the above pictures, the cutouts for the recessed heating elements are not insulated. These will be the hottest parts of the oven, so of course, they will need to be insulated. This is where the oven expands outwards. With the use of individual insulation panels on the outside of the oven, everything is able to be recessed, yet still insulated. The areas of the oven that will need these insulated panels are the 4 heating elements, the duct-work on the back on the oven, and the entire topside of the oven. All the insulated panels were framed using steel studs and rivets. However, before these are installed, you will need to install the heating elements and skin the outside of the oven with sheet metal. This oven uses four 2000-watt heating elements for a total of 8000 Watts. There are a variety of oven heating elements available. 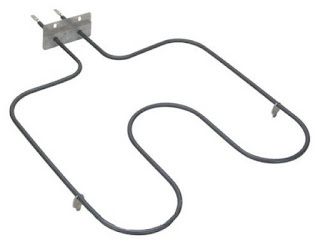 Standard oven heating elements can range anywhere from 2000 watts to 3600 watts. 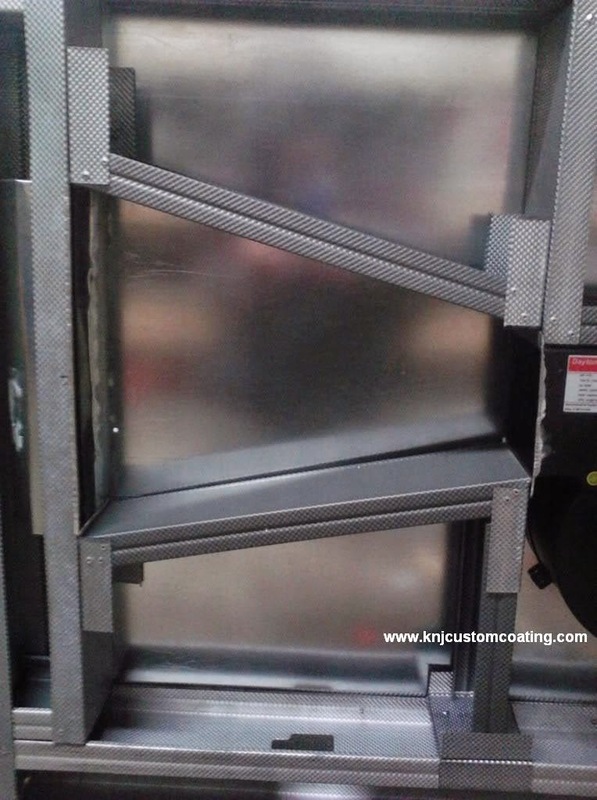 To determine what wattage you need for your specific powder coating oven size, a general rule is that you should have 100 to 150 watts worth of heating element for every cubic foot of interior oven space. 150 watts per cubic foot is ideal. The interior space of this oven is ~75 cubic feet so with 8000 total watts, that works out to about 106.5 watts per cubic feet. If you live in a colder climate, you should aim for 150 watts per cubic feet. You can also use BTU calculator for a ballpark estimate but it can be a little off. To use the calculator, you enter in the interior dimensions of your oven in inches, the average ambient temperature in your area, your desired temperature in °F, and your predicted total heating element wattage. It will then tell you how long it will take for the oven to reach the desired temp based on your criteria. Just keep in mind that 100-150 watts per cubic feet is ideal. Below, you can see the four heating elements installed in the oven. The rest of this oven build is located here: How to Build a Powder Coating Oven Part II. If you have any questions or comments, please leave them in the comments section below. I did not see my comment post. When is Part II coming out? Part II is coming next week. I should have it finished by Thursday of Friday. Thanks for reading. Hi Sean, is the size of the oven 3.4'x3.4'×6.5' inside diameter or outside diameter? Also how big are the squares that you made for the elements in the frame? In looking at your blower setup, I was having trouble seeing how the air circulates as it exits the triangular chamber. The narrow chamber on the sides looks to be blocked off by your cross pieces... I must not be seeing it correctly. Do you have a better view of the actual air flow path? What was the material cost of the oven? This is excellent. I'm looking forward to the next installment. Great article! Perhaps a comment on the shape? Vertical vs horizontal? Floor space, better for hanging parts? 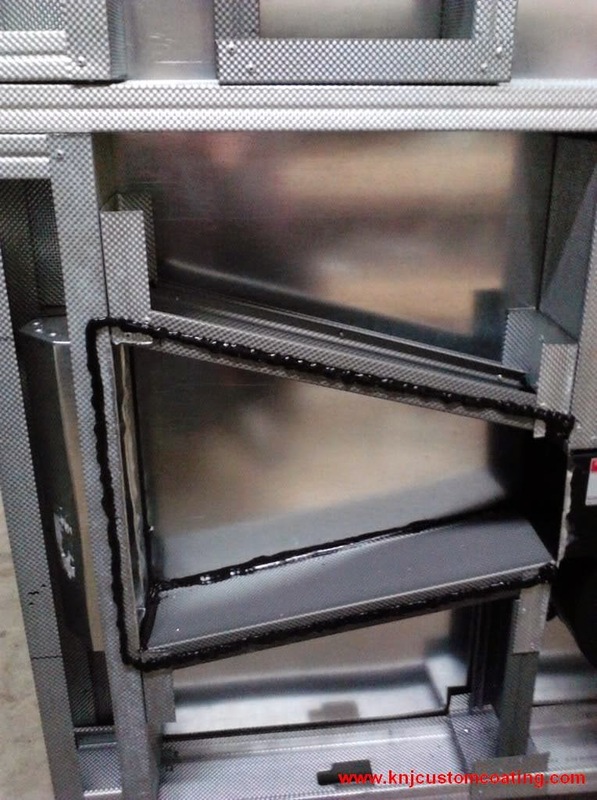 It somewhat depends on what you plan on powder coating most often, but usually vertical ovens give you the most flexibility. Parts are almost hung, so they would be hanging down. A taller oven allows you to coat longer parts without using multiple hooks like a horizontal oven would. If you are coating lots of smaller parts, you can do a horizontal oven or a vertical oven with multiple racking shelves. I would use 1/8" rivets personally, but there is no official rule. What do you estimate the total cost of the finished oven will be? The oven in this build with all of the bells and whistles ended up costing the builder $1,400 USD. If you wanted to build a bare minimum version of this oven but still the same size, I would put the cost at around $1,000. That is if you remove the mini access door with window, lights, the convection blower, 2 oven elements, and you do not recess anything into the walls. thank-you this is very helpful and i plan to start buying materials. At 3x3x3, it may be small enough that you can get away without any circulation. 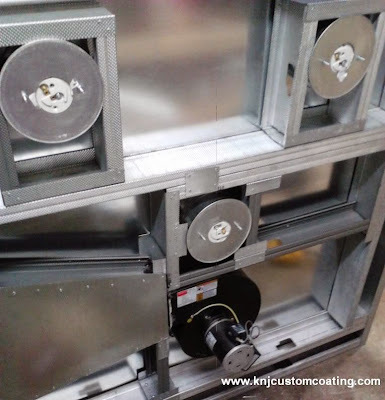 Its not ideal to not have any kind of fan or blower, but lots of powder coating ovens (even bigger than the one you have planned) do not have them. You can always build it first, do some tests by placing identical objects around the oven and checking the temps on them. Make sure there are no hotspots, ect. If there are hot spots or drastic temperature differences, then it would be best to add a small fan for circulation. Thanks for the quick response! One more though, is there a fan you could suggest for a oven this size? Ive tried searching and came up empty handed. Thanks again for the help! I would re-purpose a convection oven fan. It looks like some of them would install pretty easy in a powder coating oven. Search "convection oven fan" on ebay and you will see some units in the $40-$60 range. Awesome, I must say your Write up of this has made is much easier task to build one, I was intimidated at first but you have answered most of my questions. Thanks again for all your help Im sure others will also use these questions to their advantage! This is a really great article, very detailed. could you go a little more in depth on the wiring? Inside the control box and to the elements. thanks again. great article. I don't think using fiberglass insulation is a good idea. Set up a panel in your set up, where fibreglass is the insulation. Arrange for spark to cross between 2 conductors in that panel. You should see a large loss of fiberglass insulation in the vicinity of that spark. Now do the same for mineral wool. You should see almost no change. Yes, in terms of R per inch, there is little to choose between fiberglass and mineral wool. In use, there is a difference, and any fractional savings in making an oven will become apparent. What is commonly the largest barrier to heat transfer, is the presence of interfaces. Four interfaces conducting less than 2 interfaces. But, as your design is nominally using steel 2x4 studs, there is something else. There are a couple of companies producing aerogel products for housing. One produces a product which is nominally 1/5 inches wide. It can be applied (stapled?) to studs. I believe the R value of that 1/4 inch of aerogel is about R8. If one looks at the hot side at the location of a steel stud, and has the inside surface, a layer of aerogel, a layer of steel, more aerogel, another layer of steel, and so on, all held together by a stainless steel connector (stainless is much worse at transmitting heat than ordinary carbon steel), at some point a person becomes limited by the heat transmission through the stainless steel fasteners. If a person employs fasteners in both directions (to/away heat source), a person can further reduce heat transfer. If one is building with steel 2x4s, you might have a 2x1 on the inside (and 2 aerogel layers), the 2x4 (and 2-4 aerogel layers), and then your outer surface. If we make that inner thing a 2 inch thick thing, we are now insulating a (nominally) 6 inch space. Not only do we get 50% insulation, we get reduced heat transfer on the studs (by a lot). The price I saw for 16 feet of 5mm x 58 inch aerogel was $375, how does that figure into building an 'economical' oven? If you had such an arc, you need to improve your wiring skills because at that point the loss of insulation is the least of your potential troubles. And, you'll be pulling out the insulation anyway in order to fix the arcing problem. I think you are over thinking the insulation issue. what size fan would be needed for a 8x8x20? I am thinking of doing this with a sea container. 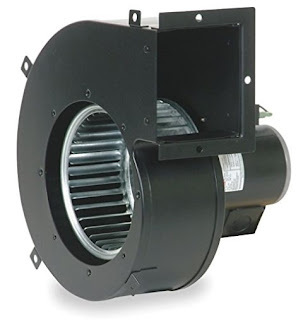 Insulate the inside and order a 750,000 btu blower. Think it would work? WOW, that would make for a monster powder coating oven. Definitely let me know if you decide to tackle that build. Unfortunately, this is an area that I am not particularly well-versed in. I couldn't give you an accurate guess on what size blower you would need for an oven that large. Using an equation I found, it came out to 1,700cfms but I don't know how accurate that is since the equation did not include the amount of air changes per hour or anything like that. If I were you, I would definitely join the Caswell Plating forum and ask them the same question, they have a group of oven builder experts that are very knowledgeable. The PID is basically a thermostat, it reads the temperature inside the oven using a thermocouple, then it tells the elements to turn on or off through either a contractor or a solid state relay. Great write up! Easy to follow. Thanks for taking the time to share this. Wondering could you provide more details about the wiring of the unit please. Do you by chance have a schematic? Unfortunately, I do not have many details or a schematic for this oven build. Here is a detailed schematic that would show you how to operate 4 elements with a PID controller but it does not include the timer and other accessories that were included in this oven buiild. I hope it helps though. Another question for ya. I'm not going to be using the oven for powder coating. For my proposes it's a pre-heat oven. What are your thoughts on the glass in the main door, I won't be utilizing a small door in the large one, being 2/3 the size of the door? I don't feel there would be a problem but I have never done this before. If you install it the same way that the builder of this oven did, I don't see it being a problem. The main issue with the idea is that glass and metal expand and contract at different rates depending on the temperature. So make sure you device a way where the glass is not solidly mounted to the steel. Also I would use 2 layers of thicker glass with an air gap between to cut down on heat loss through the glass since it will not be insulated. Thanks for the double glass idea! I would not have thought of it. 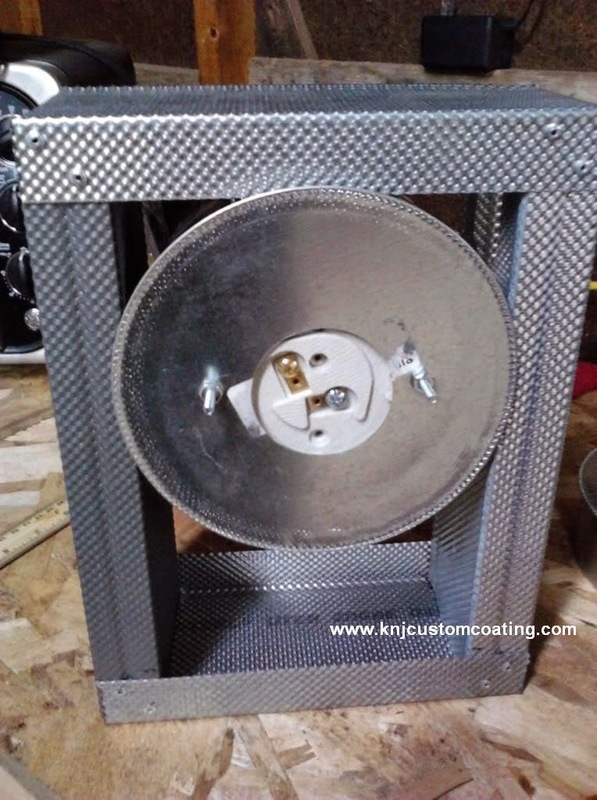 Are you not afraid that the fan will blow the powder coat off? It is important to select a fan that is not too powerful for your powder coating oven. You don't want the inside of your oven to be like a wind tunnel, just slightly moving air is all that is needed to regulate the temps. If your fan is blowing powder off of your parts, you would either need a different fan or find a way to reduce the fan speed so there is not so much air pressure inside the oven. Awesome article. Thank you for the time you put into all of this. I do have one question. Are 25 gauge steel studs to thin to build an oven out of? I have never messed with steel studs before, but 25 gauge seems awfully thin. You are right, the 25 gauge is very thin, but it is what the builder of this oven did use, and you'll notice that he doubled them up almost everywhere which greatly improves the strength. 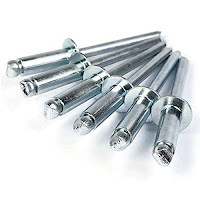 However, you can definitely opt for thicker gauge studs, you just may have more trouble finding them as I believe the 25 gauge studs are the only kind sold in the local big box stores. I may be in the wrong spot but I need to know what I need to build my pid. Can someone help with that .? I have an oven 4x4x6 with 4 3000 watt elements. is there a formula to determine BTU per cubic foot? There is a fairly accurate calculator to help you figure out how many total watts you will need to heat up an oven in an acceptable time frame. You will need to open it in a spreadsheet. If you have trouble with it, just give me the parameters listed below and I'll let you know the results. Some things will affect this such as your insulation, mineral wool will allow the oven to heat up faster than fiberglass insulation. Also the thinner your sheet metal used to build, the faster it will heat up. However, thinner sheet metal will allow the oven temperature to fluctuate more after it is heated up. Its good to find a happy-medium. This oven uses 4 2000W heating elements, so 8000 Watts total. The calculator says it will take about 27 minutes for this oven to reach 450 degrees. What kinda sheet metal are they using in this build? 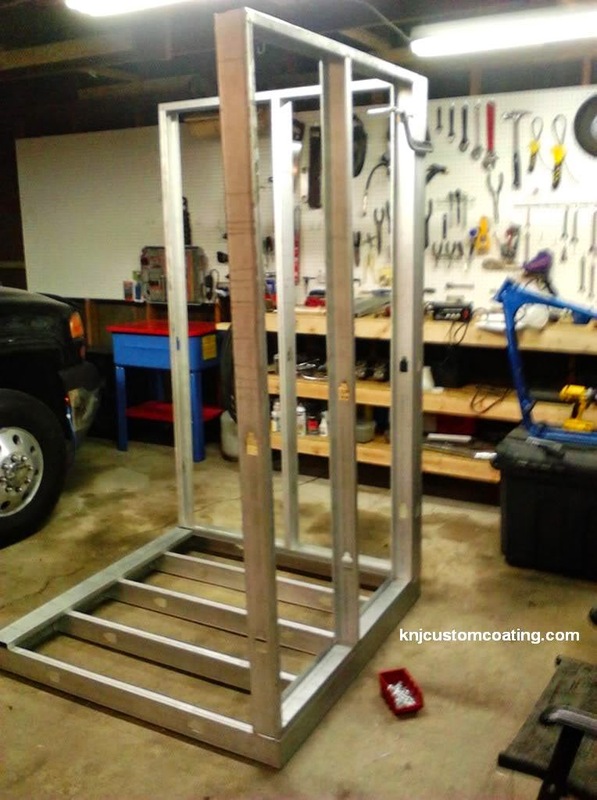 This build uses 20 gauge steel everywhere except the floor, the floor uses 16 gauge steel. 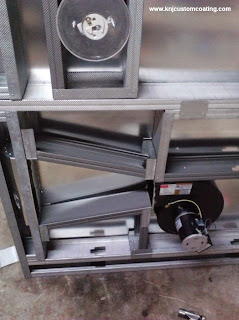 What about using a 1500 watt infrared patio heater for a small 3X3X3 oven with convection fan? Unfortunately, I don't have any personal experience with infrared heaters. But it is my understanding that they work on more of a line-of-sight basis than to actually heat up the entire oven to the proper temperature. Meaning the area of the part that is facing the heater will cure, but the other sides will not, meaning you would have to rotate the part so each area is facing the heater for the correct time at the correct temperature. I may be wrong, but that is how the infrared curing lights work. I would advise you to join the Caswell plating forums and ask this question in the oven building section. There is bound to be some guys there that have used this type of heater to cure parts and they would be better suited to answer it correctly. Hope that helps. Thanks for reading. I'm trying to learn the PID and SSR. Do you need a SSR per heating element? I am using two ssr's and 4 heater element. 2 each ssr. just don't max out the SSR. 40 amp SSR and max watts the 2 elements use will be 5120 watts. Check your PID to make sure you don't over load it on controlling the SSR's SSR use some power to control them. That Oven Calculator Works great, I was going to build my over 12 L x 6 W x 6 T BUT with the 10340 watts in heater it would take 96 mins to heat up. I am going back to my 8.5x3wX6 tall and that dropped my time down big time. and the Outside box I am using. I can build inside that the size I need and use Propane between the oven and Steel Box I have (12x6x6) and cut the time down even more. I don't want to add more heaters.1. I am only powder coating for my self. I have CNC plasma cutter table 4x8 is the max I can cut. SO why have any more oven. Hi thats a great build! Would you know if a regular house outlet is able to handle the 8000 watts that the heating elements take or can it cause a burn in the electric system? Standard 120 volts is rated at 20 amps, with a 20 amp breaker. But the wall outlets are almost always rather 15 amps. You can tell as the 20 amp outlets have a horizontal cut in one of the slots as well. That 120v 20a outlet will handle 2,400 watts. Older homes may only have 15 amp wiring. A 20 amp 220 outlet will handle 4,400 watts. That's the normal outlet used for heavier air conditioners in the home. Never actually load a home circuit at more than about two thirds of constant current! Neither is useful for 8,000 watts, obviously. Using the simple formula of volts x amps, we get the amount of watts a circuit can handle. Watts divided by voltage to get the amps. Therefor we can use 8,000 watts and divide it by 220 volts to get 36.37 amps. The closest to that is 40 amps. That's too close, and you would really need at least a 50 amp circuit, 60 amps being better. Hey Sean, I wanted to start by saying thank you for spending the time to make this website and to share your experience's with everyone. I had a question involving the temperature of the outside of the powder coating oven. Assuming I make an oven to the same specs as the one in the guide, would you know the outside temperature? I want to build one of these ovens and put it in my shed/barn, but the problem is the floor is plywood and I am concerned about fires. I know there are steps to take to make sure the walls don't get to hot. So my real concern is the plywood floors. I was thinking of making a steel frame for the oven to sit on so it's not in direct contact with the floors. What is your opinion on this? The oven can be warm to the touch on the exterior, maybe 120 degrees at most. I would think it would be safe, but if you have any doubts, it would be best to build something to provide a gap between the bottom of the oven and the floor. Just something to provide an air gap underneath. Hello powder coat guide, first off thank you . you have helped me out with powder coating !! im in the process of making a bigger oven, i really like this build, im wondering if i could go a foot deeper and a foot wider and leaving everything as is in the build, since you mentioned its got more fire then needed with the 4 2000 watt elements. Hey great build. Building my own right now. I have a dumb question hopefully you can answer. Can the heating element terminals touch the insulation or should I remove the insulation from around the terminals? Don't want to cause a fire lol? Hey Danny, You ever get an answer to this question. I'm in the process of mounting my elements and the connections would be a few inches into that insulation for the floor of the oven. It would be best if the heating element connections where not in contact with the insulation. That's what I was thinking. Was going to add a some framing to create a little channel under the element that would have no insulation. Thinking since is it on the floor and will have insulation all around it should not cause an issue. This oven uses 20 gauge sheet metal on the interior and exterior and 16 gauge for the floor of the oven. 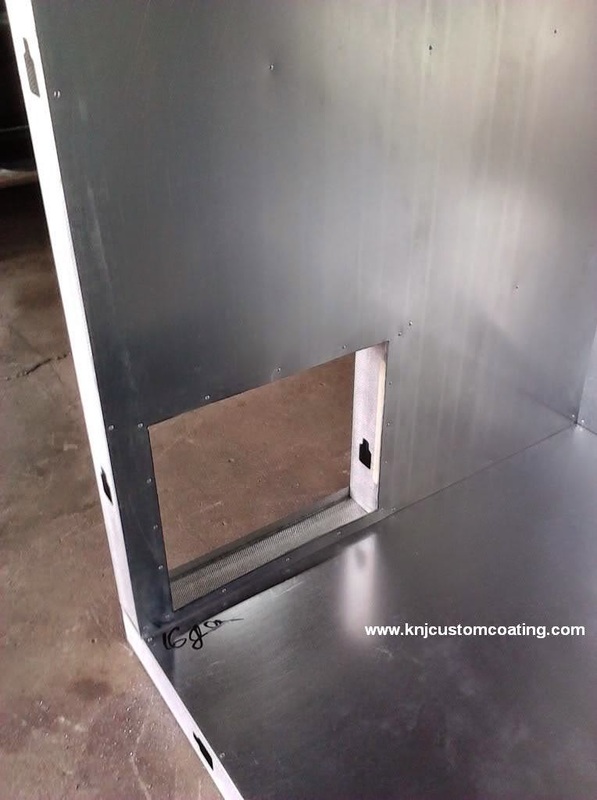 It is very common to use 18 to 22 gauge sheet metal when building powder coating ovens. Hey Sean, im having trouble sourcing steel studs that will work together with each other. all i can find is the stud with a lip on the inside edge that either needs to be bent or cut to work. its the exact part number as what you provided. i cant seem to understand how these interlock with each other. what your looking for isn't sold at home depots. I know, I looked. Search on google for steel stud distributors around your area. They are cheaper and have exactly what your looking for. As for the fit, you can still use the studs with the lip just bend them back or cut them. It will bulge out a little but it will still work. What you are looking for exactly is stud and track, The stud fits into the track which compensates for that extra 1/8" difference side to side. Lamps can be used to cure powder coating, however it is not as simple as pointing a lamp at a part. The heat from the lamp has to be contained in some way around the part so the part should still be in some type of insulated box while using an infrared lamp. Most people just opt for an oven due to the cost and complexity of the infrared lamps. There are some ceramic coatings that cure at a higher temp than powder coat so I will give your recommendations based on an oven that cures at 500 degrees. However, if you plan on using a product like Cerakote that cures at 225 to 300 degrees, then these are overkill and you can use the same products recommended in the article. For sheet metal, I would use 18-20 gauge and 16 gauge on the floor. Use mineral wool insulation. Using the BTU calculator, it is showing that you will need 20,000 Watts of heating to go from 65 degrees F to 500 degrees F and it will take 55 minutes. For 20,000 watts, you'll need 4 5000 Watt heating elements. However at that point, they will be pulling about 83 amps so the standard 60 watt breaker won't do. You would have to wire it to two breakers. Or you can do a propane fired oven. This article is great. Thanks for putting the work into it. We have the frame up and the inside skinned. Am now ready to duct the exhaust fan area between the studs, but can't figure out from the pictures what was used to duct that up, can you just use excess pieces of the 20 gauge we are using for the rest? Thanks, the type of ducts used are called stack ducts or wall stack ducts. I have included this info in the article along with a link to the product. The piece that angles the duct from the wall to the top is called a stack duct elbow. 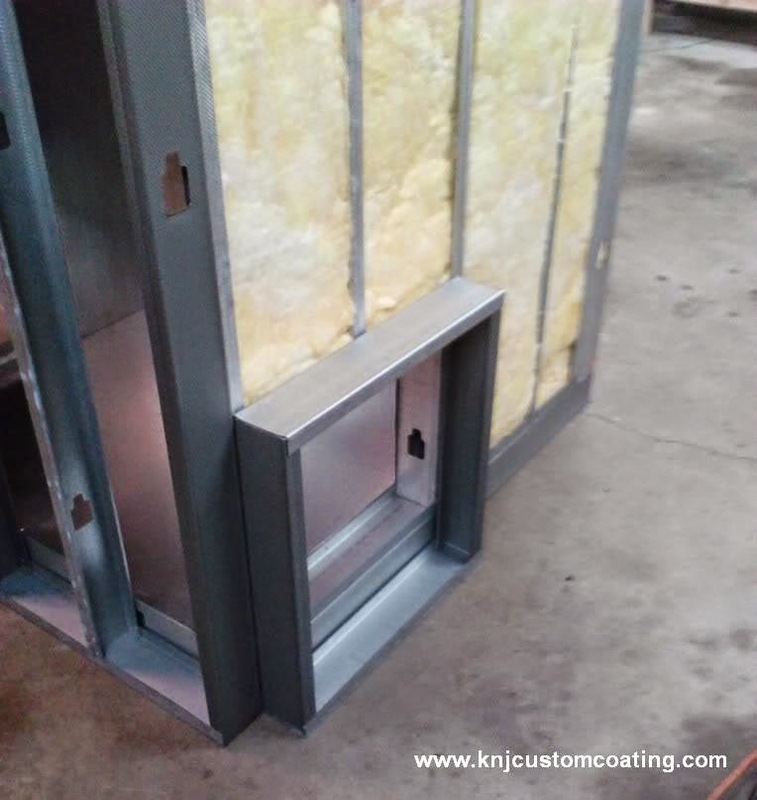 You could use the steel if you want to shape it, but using the pre-fabbed ducts are a lot easier and ensure a good seal. CAN I JUST BUY A OLD STOVE AND TAKE ALL THE CONTROLLS OFF IT TO SAFE MONEY, WILL THAT WORK? Really, the bulk of the money in this oven build is in metal. The actual controls and wiring make up around $100-$150. If you are going through all of the trouble to build the oven, I highly recommend building or buying a control box as well. Household ovens are built to power 1 heating element at a time and it is very unlikely that 1 element would even get an oven of this size up to 400 degrees. If it managed to, it would take several hours. The other issue is the very relaxed way that household ovens control the elements. They turn the elements on for a period of time, say 30 seconds, and then off for a period of time. This results in oven temps that can fluctuate 25 degrees in either direction. This oven uses a PID controller to control the heating elements and it is constantly adjusting the temperature so you will have much more stable oven temps. What I might recommend for you if you want a decent size oven on tight budget is either a household double oven. With a double oven, you can cut out the divider, add some sheet metal around the cut edges and seal it all up with some high temp sealant. Then do take the two doors and attach them together and add some hinges on the side instead of the bottom. Here is exactly what I am talking about: http://eyecit.net/?page_id=590 (copy and paste in browser). Dear Sean, thanks a lot for the great instruction. Is there a posibility to get the wireing plan again because the link does not work. Thanks in advance. i read somewhere about having something over the oven element to protect the powder coating parts from direct exposure it that right ? Yes some people have added shields over the elements to prevent radiant heat from over curing the powder. I have heard some issues of this causing the heating elements to overheat causing them to stop working prematurely. If I were to add shields, I would either add lots of 1" holes to allow some airflow across the elements or do some type of louvers. Hey I was thinking. Instead of using the 3 1/2" studs one the 3 walls and the top, what about using 6" studs. You wouldn't have to add all of those extra boxes on the outside and it would look more flowy (if you know what I mean). It would also let you be able to put more insulation into the walls which in return helps on retaining heat. But still do the 3 1/2" studs for the door and the bottom. Yes it can be done with 6" studs and with the right planning, you can build everything into the walls without having any boxes protruding from the sides. Here is an example of an oven with 6" studs: http://www.priority1signs.com/index.php?id=491 Notice how thick the walls are compared to this oven build. Hey what would you do differently to make the floor flat so you can roll a cart in the oven? I am not well versed in the construction of the floorless ovens but of the ones I have seen, they usually use beefier studs like 6" structural studs. Since the oven is missing the piece on the bottom that normally ties together the 3 walls, I would make sure all of side walls and back walls are all attached very securely to each other. Use lots of rivets/ sheet metal screws/ or weld it. Also make sure that the bottom of the door is very close too the floor as the door seal would mount on the bottom of the door and brush along the floor to seal. If you do decide to do an oven with a floor, consider a rack that can slide on a rolling base. The top of the base should be the same height as the floor of the oven. Wheel the rack over to the oven and slide the rack off of the rolling base into the oven. You can also build a simple mechanism to lock the rack and base together when rolling around. I WAS ORIGINAL LOOKING FOR A HEAT SYSTEM TO FORM PLEXIGLASS. I NOW THANK YOU VERY MUCH FOR PUTTING THE TIME IN AND GIVEING US ALL THIS INFORMAITION. 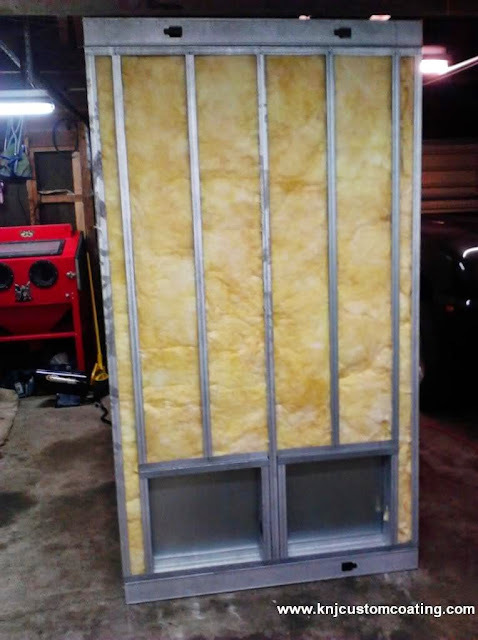 I AM BUILDING A 4’x8’x8’ HEAT BOOTH USING THIS INFORMAITON. I AM WORKING WITH AN ELECTRICIAN AND HOPE TO BE UP AND RUNNING IN ABOUT A WEEK OR SO. I JUST ORDERED ALL OF THE PARTS THREE DAYS AGO AND MOST HAVE ARRIVED. I NOW AM GOING TO USE THE BOTTH FOR POWDER COAT, FORMING PLASTICS AND CURING FIRBERGLASS PARTS WE MAKE AND REPAIR. AGAIN THANK YOU FOR ALL OF THE LINKS WHICH SAVED ME MANY HOURS. IN A WORLD WERE BUSINESS IS GETTING HARDER, IT IS NICE TO SEE PEOPLE WORKING TOGETHER. 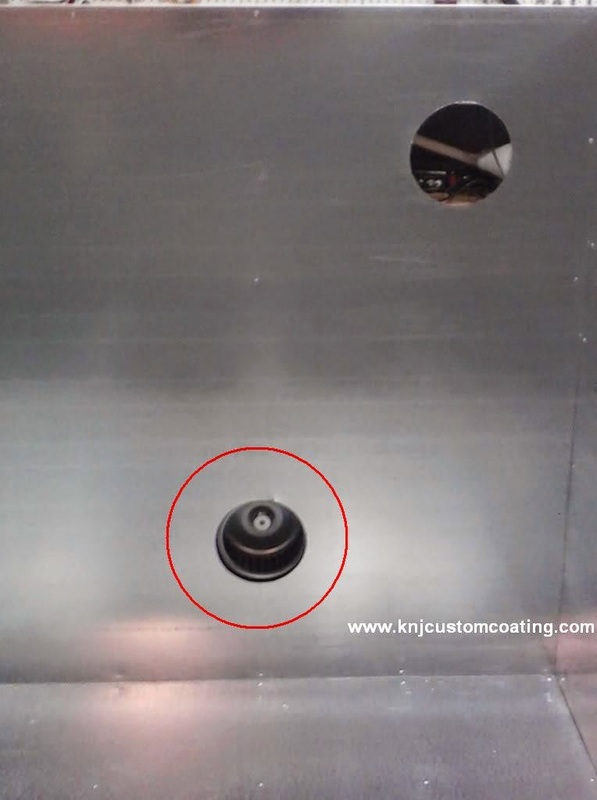 Most powder coating manufacturing companies state to get your oven to operating temperature BEFORE putting your item(s) in. Even different colors from the same manufacturer may have a different cure temperature. Hope this helps. Thanks Sean, really, really helped me on my build! what would the cost be to build an oven that is 10' wide by 8' high by 40' long?? You're welcome. I'm glad you found it helpful. Good luck with the oven build, I also prefer to do everything myself. I was wondering the same thing. I have completed my inner walls, lighting and fan duct, but was wondering about the gaps where the walls, ceilings and floors meet. Should i use permatex to seal them up, or leave them. 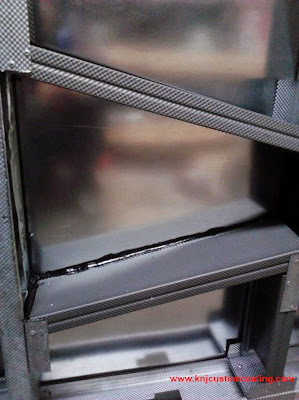 Also was wondering if i could use the aluminum tape to line the inside or outside of the duct to insure a proper seal. Was kind of wondering about the tape because you say to be sure to use steel rivets and not aluminum. I made mine 36x36x72 and I'm making a rolling rack system and a sliding rack system for it. Your help would be greatly appreciated. I have seen some ovens where the seams are all sealed shut but the most common practice is to do nothing with the seams. Ovens do need to vent as the air inside the oven heats up and expands and these seams allow for some ventilation. Some people will also build in a vent pipe near the top of the oven such as a 1/2" to 1" pipe with flanges on the inner and outer wall. Excellent build. Im wondering about the top after the blower and lighting is installed. How do you insulate the top? It appears there is just the inside sheathing with no insulation and an outside sheathing of sheet metal. There are insulation panels on the top of the oven as well. 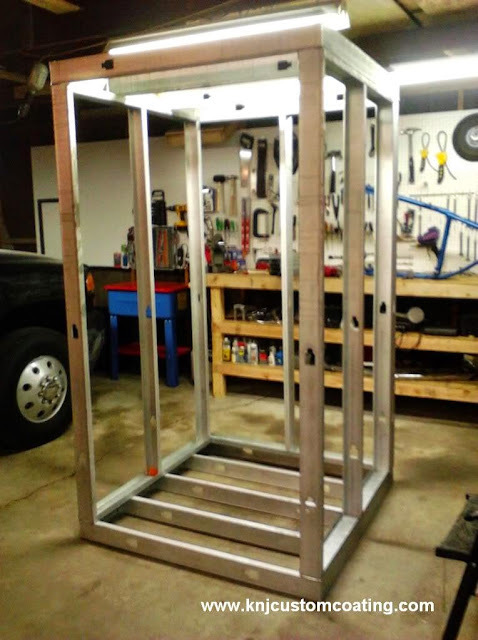 I do not have any finished pictures to post but there are pictures in "How to Build a Powder Coating Oven Part II" that show the top nearly completed. I was just wondering if there are any blueprints for this type of oven? Or something similar. Some notes and suggestions after building these. Metal costs have climbed so the cost to build one is going to be probably $300 to $400 USD higher minimum. You don't need 220v indicators, you have 110v available to you so keep it simple and wire you panel using 110v, only the SSR or contactor needs 220v to power the elements. Check the Dayton blowers specs, some are 1/2 inch too tall and won't fit withing the 3 5/8 stud height as shown. Also burying the blower into the cabinet like shown subjects the wiring and motor to temps higher than they were designed for. 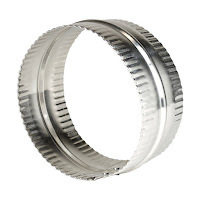 Only the bearings are high temperature. The motor has a cooling fan that can't function properly when closed in like shown. I mounted mine on the back and used double wall stove pipe for intake. This leaves the non high temp wire, motor capacitor and motor cooling fan exposed to room temp air. Just my advice having just completed one similar to this one. I had a question about insulation. 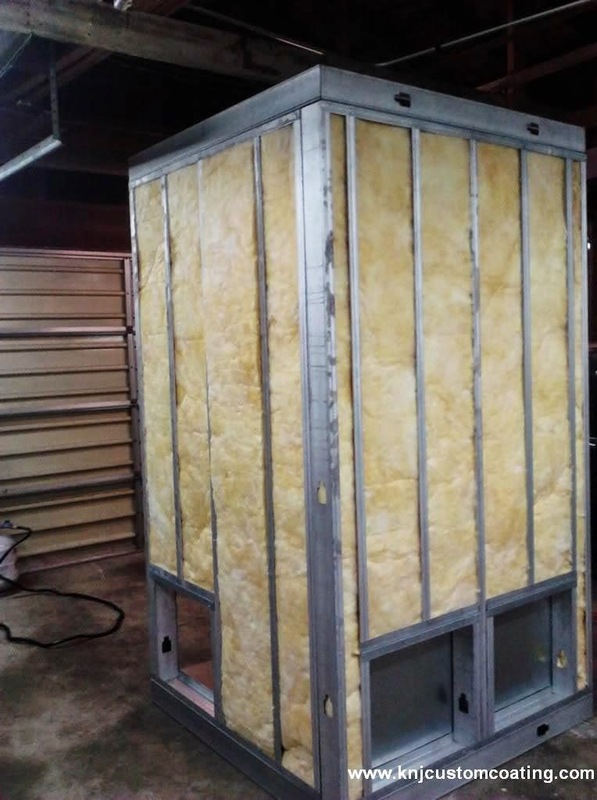 Could you use the expanding firebreak spray insulation in this? It would seem like the best option for filling every nook and cranny... assuming it can take the heat. I cannot actually find the temperature limits of the Fire Break spray insulation but I am assuming that a powder coating oven would get too hot for it. While it is not supposed to be flammable, it would likely loose its insulating properties at 400 to 500 Degrees F. This is an assumption on my part because I cannot find the information online and usually spray insulation capable of handling enough heat are generally much more expensive than the Fire Break spray insulation. You could try giving the company a call and seeing if they have any info for what the temperature limits are. Hope that helps some. 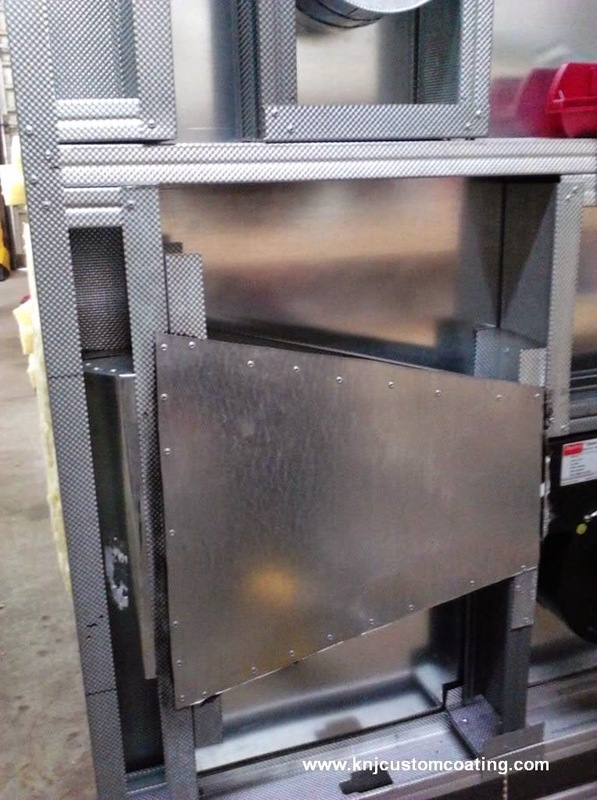 - Create some type of diffuser/heat shield to reduce direct heat to substrate by either placing some sort of high temp mesh barrier in front of elements or use a high temp grate or louvered metal (similar to the ones used on A/C unit room doors). - Create a more typical Convection design by enclosing elements in the walls and use the circulation fan to push air through the elements and into the oven heating space through vents leaving no elements exposed. I do realize that this will make things a little more complicated but if the results are worth it I'm all for it. in any oven you need to insulate the internal surface from the exterior. 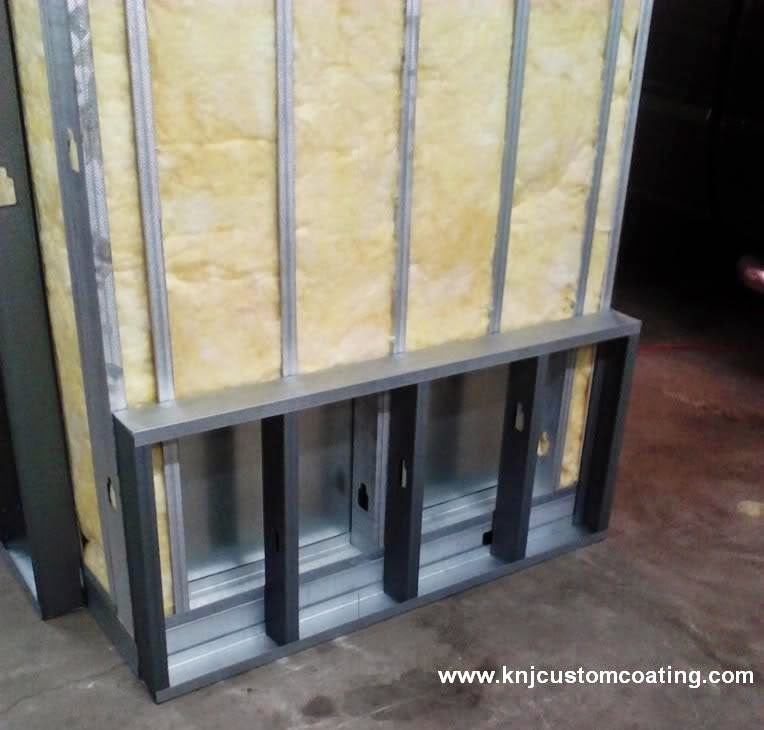 any bridges of this insulation will transfer excessive heat and therefore increase the cost of operation, this will heat the outside greatly. A major fault that I see in the design of the oven is that the metal heat conveying studs connect the internal lining to the exterior skin. this will conduct too much heat and increase running costs. there needs to be an insulating barrier between the internal and external surfaces with no bridges to conduct heat. either use Hebal paneling with tracks to hold them together for the exterior wall or a double skin of narrower studs. The studs for the interior skin being offset to the exterior studs with the insulation weaving between the studs. Hi After more consideration of the design, I would add that the ducting for the blower is all insulated from the external skin. Again this will loose too much heat. It would be much better to have a totally separate duct secured to the inside of the unit thus it will be insulated within the external wall. Also the ducting should draw air from the bottom of the oven chamber and blow it to the top. this will maximize heat distribution and reduce hot layering. another point is that the elements should not be in direct view of the parts being heated as the infrared heating of the items will have a hot spot. It is better to drape an metal panel in front of the heating elements to prevent direct heating. I did this build minus the lights, door hole and circulation fan. I mounted my thurmocouple at the top middle of the unit. Here is my question. When my pid starts it is at 0 for temp readout. Shouldn't it be at like room temp 60ish? Is my thurmocouple in a bad location? Do I have to have circulation for this build to work? What type of sheet metal was used? hi ! i have a question as to how much is the cost of this oven. i would like to know a rough estimat eon materials if possible thanks in advance . awesome gude by the way looking forward to do mines soon ! I'm building a large 6x7x18, 750 square ft oven. By the Blu calculator I only need 5 3000w elements. This does not seam like enough fto me. I'm planning on using at least 6 then test it, anyone have any thoughts on this? I no the more. Have the faster it will heat up, but I don't want to geek I'll either. I like the design. One thing I would change is to modify the bottom for lifting by fork lift or pallet jack. Yes, you are correct. Thank you for noticing that and letting me know. I have corrected the article and the information is now accurate. Hello Sean, I'm following your plans here very closely wanting to build the same size oven. I did not see an answer from the question above... "Also how big are the squares that you made for the elements in the frame?" I have not ordered my heating elements and want to keep building the walls. I plan on ordering the element you sent the link on. How big are the squares you built for the heating elements? I look forward to your feedback and have a good day. I would like to know the pros and cons to fan mounting location. Seems to me the fan motor would catch a lot more heat mounted on the top of the oven as shown as opposed to the side of the oven. Would a side mount fan hurt the circulation too much? I think the lifespan of the fan motor would be much better mounted near the top of the stack duct opening on the RH side of the oven. And cheaper and easier to build. Thoughts?? This way, the motor itself is almost completely isolated from the heat. Is there steel between the elements and the insulation? Yes, all of the insulation is shielded by steel. As far as the rivets goes, the 1/8 x 1/8 1000 pack doesn't exist on Amazon anymore. And the 100 pack's are $20 each. They are 3/16" Diameter x 1/8" Grip steel blind rivets. 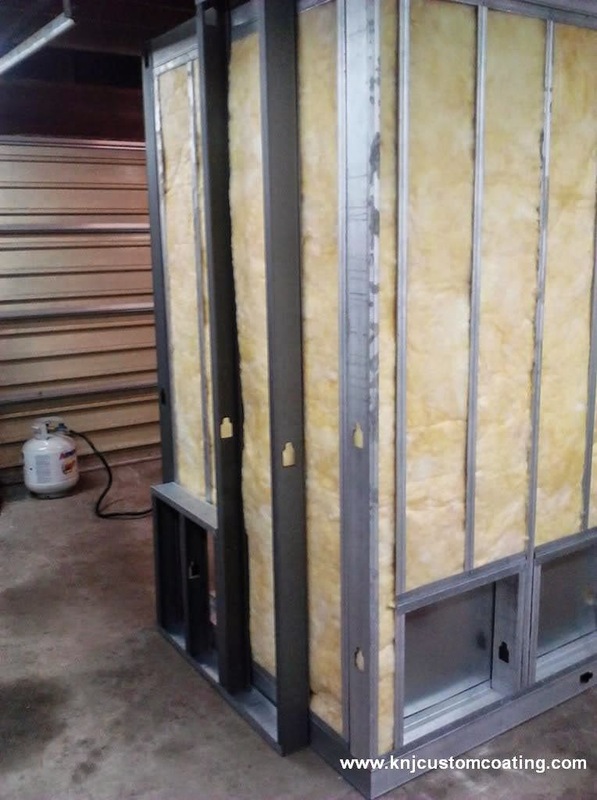 I'm still concerned about using fiberglass insulation in my build. Some places say fiberglass insulation can melt at 200 degrees other say it's at 1300 degrees. Have you had any problems with the fiberglass in your build? I have never heard of anyone having issues with fiberglass insulation in a powder coating oven build. I believe most standard household ovens use fiberglass insulation as well. According to most sources, fiberglass insulation has a high temperature limit of 1000 degrees F and there is no reason for a powder coating oven to see temps that high. Hope that helps. 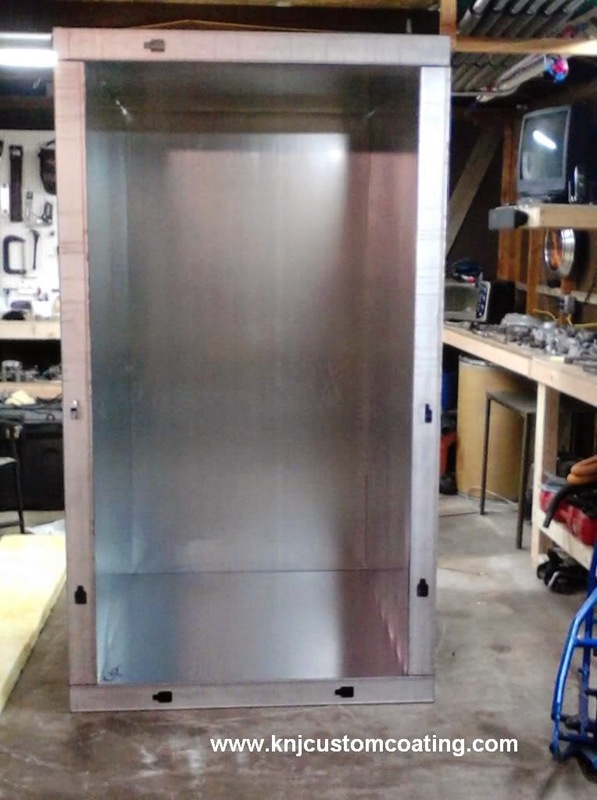 I built a small 2'x2'x2.5' oven, made from metal studs/sheet metal. 4"thick, 8pcf mineral wool insulation. 1000w element(100w/cu.ft. ), and it won't get up to temp. maxes out at about 340*F after about an hour. My thought initially was air leaks from the heat chamber, but sealing all the edges w/ RVT only slightly improved things. My next course of action will be to seal the exterior skins, preventing any natural convection in the wall cavities from bleeding thermal energy out of the system. If that doesn't work, I've got a 1500w system that I'll swap the elements with. Do you have any other tips, perhaps something I've overlooked? As long as your PID settings are dialed in correctly, I would say that you just need a little bit more wattage from your heating elements. In theory, for that size oven, you should be right around 1000, but increasing the element to 1500W or 2000W should allow you to reach the correct temps in a reasonable amount of time. Is the galvanized sheet metal toxic at a certain temperature?? 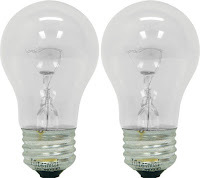 Does anyone know what trim piece was used on the bottom side of the lights? It is the "6-inch Duct Cap without crimp" mentioned above with a hole cut in the middle of it using a hole-saw.